Putler integrates with MailChimp and enables you to export all your customers data to MailChimp. Putler’s RFM analysis provides you 11 different customer segments – champions, loyal, sleeping, lost and others. Each segment contains complete customer details. Click on a particular segment and you will get customer details for that particular segment which you can export it to MailChimp. The biggest advantage here is – exporting different customer segments as different lists to MailChimp enables you to tailor your email pitch for each customer segment, thus increasing your chances of conversions. You need to enter your MailChimp account details. Once authenticated, integration will be successful. All your customers belonging to that segment will be directly exported as a list to MailChimp. 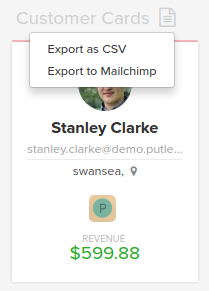 Moreover, you can also export your entire customer list to MailChimp or download it as CSV from Putler’s sales or transactions dashboard.